Atlanta Motor Speedway is gearing up once again for the fifth installment of its annual Summit Racing Equipment Atlanta Motorama, the massive automotive festival celebrating anything and everything with an engine. 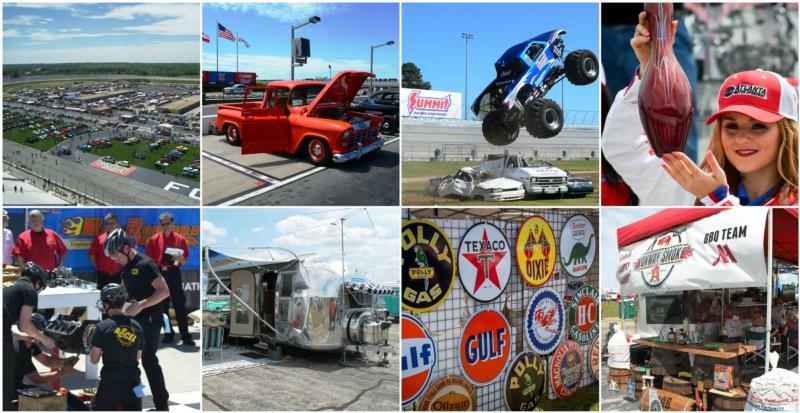 In just over a month, on April 28-29, the premier motoring festival, one of the largest of its kind in the Southeast, will again transform the infield at the storied superspeedway into a two-day auto-themed extravaganza full of classic cars, hot rods, rat rods, motorcycles, RVs, a BBQ cook-off and everything in between. In only five years, the Atlanta Motorama has developed into an annual premier destination for gearheads, families and auto enthusiasts alike, and it continues to grow year after year with more cars and auto-themed entertainment covering nearly every square foot of AMS's expansive infield. This year, Motorama mainstays like the Pull-A-Part Swap Meet, vehicle-for-sale corral, autocross competitions, the classic car auction, kids' activities and the enormous vendor midway will all be back in action. Meanwhile, exciting feature attractions for 2018 include the actual Cousin Eddie's RV from the classic holiday film "National Lampoon's Christmas Vacation," an exact replica of the Optimus Prime® truck from the popular "Transformers" film franchise, a Russian military Tupolev "007" spy boat, a collection of rare military vehicles, and much more. "The Summit Racing Equipment Atlanta Motorama is one of the biggest, most unique family-friendly events that we host each year," said Ed Clark, Atlanta Motor Speedway President. "The show has a unique and expansive variety of attractions, and it's an absolutely fun, affordable way to spend a day with us here at the Speedway." Motorama fan-favorites like BIGFOOT® and its adrenaline-pumping car-crushing exhibitions, the Show Car Garage with dozens of national award-winning vehicles, vintage trailers, competitions by Hot Rodders of Tomorrow, the Pinstripers' Panel Jam and the Million Dollar Salon featuring exceedingly rare, high-dollar vehicles will also all be back and better than ever at this year's 2018 show. Plus, the Atlanta Barbeque Classic, a Speedway Children's Charities-benefiting event that adds a whole new flavor to Atlanta's Motoring Festival, will tantalize taste buds, as many of the Southeast's most renowned BBQ teams put their recipes to the test in a winner-take-all cooking competition with $10,000 in awards and prizes on the line. Participant entry into the Summit Racing Equipment Atlanta Motorama is open to anything with an engine, ranging from classic cars, muscle cars, custom cars, imports, rat rods, hot rods, trucks, big rigs, motorcycles and even boats and RVs. Awards will be presented to hundreds of participants, and all participant entries will be eligible to win a portion of the nearly $20,000 in cash and prizes handed out at the show, including a Super Prize Giveaway that features a turn-key Chevrolet ZZ6 engine. Registration forms are available now at www.atlantamotorama.com. Best of all, spectator admission to Summit Racing Equipment Atlanta Motorama is only $12 per day. Kids ages 6 to 11 will be admitted for $5, and kids 5 and under will be admitted for free. Camping at the speedway is available during the event, and full hook-up and dry camping can be reserved for the weekend. For more event information and to purchase tickets, visit www.atlantamotorama.com or contact the Atlanta Motor Speedway ticket office at (770) 946-4211 or (877) 9-AMS-TIX.